Thirty companies in eastern China that make preserved duck eggs have been shut down after state media reports showed that industrial copper sulfate was being added to the eggs to speed up the curing process. 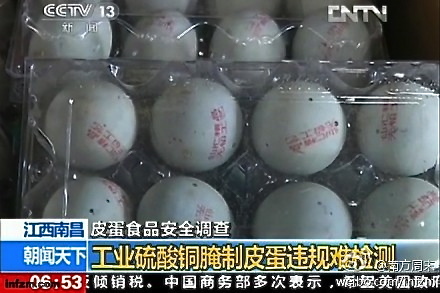 All preserved eggs in the companies were seized by the authorities for testing. Preserved duck eggs, also called thousand-year eggs, are a popular ingredient in China and Taiwan. The curing process involves preservation of the eggs with salt, baking soda and calcium oxide for two months, making the eggs stiffer, saltier and darker. Copper sulfate cuts the process down to one month. Indeed, the more the curing process is sped up, the higher the amount of industrial copper that will be needed, meaning more harm to consumers, according to China Central Television, the official state broadcaster. The Jiangxi Copper Ltd. company told state-run media that it had refused to sell copper directly to egg processing plants because copper was hazardous for consumption. “Possibly the factories bought the copper from distributors,” they said. The CCTV reporters found a few half-empty copper sulfate bags in one of the processing plants. A plant official insisted that the copper sulfate observed was a food additive, not an industrial product. Copper sulfate as a food additive has been allowed by Chinese food safety law since 2010 as an alternative to the banned lead oxide. At another plant, a reporter found packages of copper sulfate that lacked industrial or food additive labels, so their function could not be ascertained. Amidst the buildup of food scandals, Dong Jinshi, a food safety expert in Beijing, gave advice for Chinese consumers on telling the difference between a toxic egg and an edible one. “If the egg has a high content of a metal such as lead or mercury, then the egg will have more black spots.” He also mentioned that poisoned eggs have a strong amine odor, pungent to the respiratory tract. The timing of the preserved duck eggs scandal coincides with the start of China’s National Food Safety Week, where ten days of “exhibitions, forums, and prize quizzes” will be held to educate the public and encourage safe food. China has suffered from a slew of food-safety scandals, from having half the staple grain in one of its largest cities be contaminated with metal in May, to having 386 students fall ill with food-poisoning symptoms from school lunch last Thursday in Sichuan province. Research contributed by Ariel Tian. Several brands of baby food were recalled in China this week, including a substandard milk formula. The Dragon Boat Festival, known in Chinese as “Duān Wǔ Jié” (端午節), is here once again.